Click the thumbnail crop to see the whole illustration! December isn't all about illustration - writers we want you to join in too. Can you comment on our advent images with a tweetable micro story? 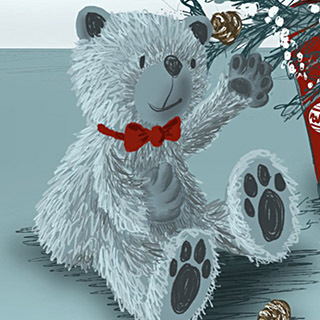 @Words8Pictures and @SCBWI-BI will tweet those that fit into 140 characters with your twitter handle and #W8PAdvent. For a boy or girl to love. Advent 25th December MERRY CHRISTMAS!